CLEVELAND, N.C. – October 9, 2017 – Today, Freightliner Trucks and Old Dominion Freight Line celebrated its longtime partnership at a celebration at Daimler Truck North America’s (DTNA) Cleveland, N.C. truck manufacturing plant. 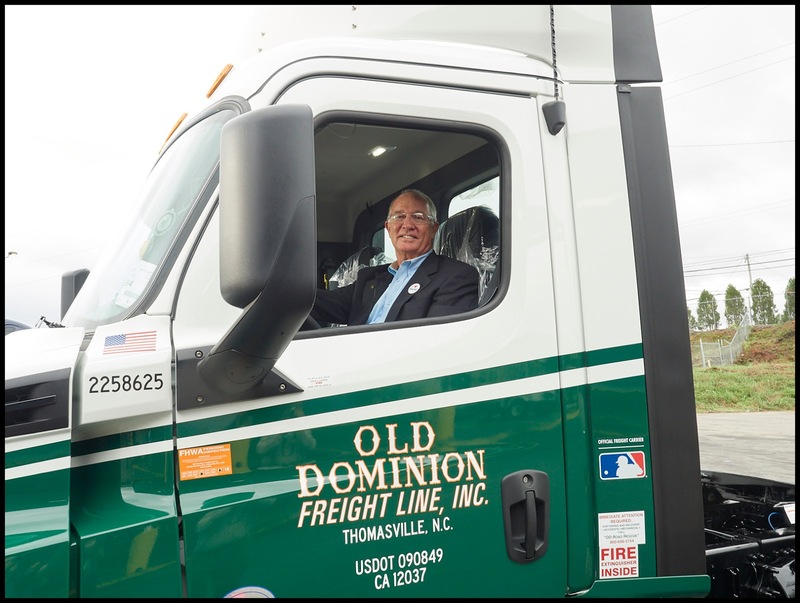 Old Dominion Vice Chairman of the Board and CEO David Congdon was behind the wheel of a new Freightliner Cascadia® for a ceremonial roll off the assembly line. This truck – which marks the 15,000th Freightliner purchased by the Thomasville, N.C. less-than-truckload carrier since 1991– is also the first new Cascadia model to be built at the Cleveland truck manufacturing plant. 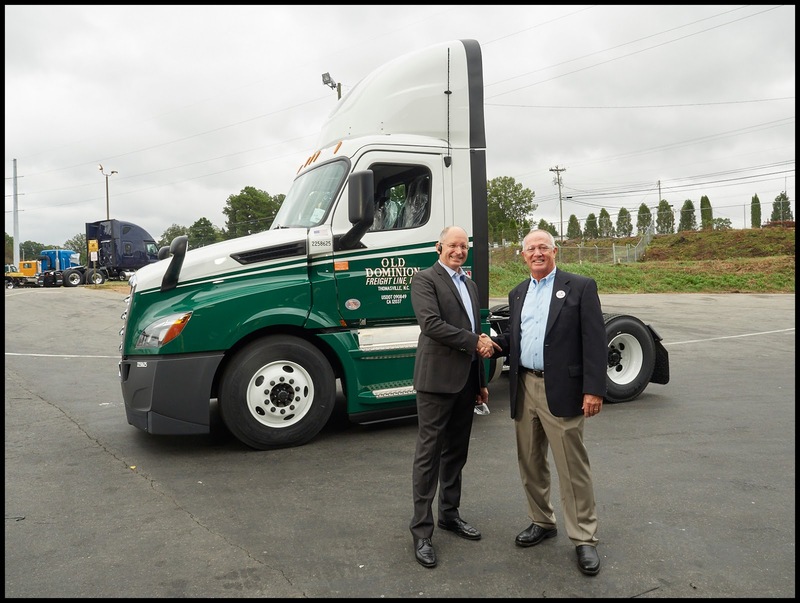 Freightliner customized the new Cascadia to Old Dominion’s specifications to maximize utility, safety and efficiency for its nationwide operations. The companies’ ceremony took place at the plant’s truck museum, where some of DTNA’s most notable trucks and the company’s history in Cleveland is showcased. Old Dominion executives toured the assembly line, inspected the robotics and manufacturing processes, and met with the plant employees who helped build the truck. Freightliner and Old Dominion have similar backgrounds. Old Dominion started in 1934 and quickly became one of the nation’s leaders in hauling material needed for World War II. Meanwhile, Leland James launched Freightliner Trucks in 1942 because he could not find a company that would build a lightweight tractor to navigate the western Rocky Mountains. Today, 75 years after James started building his own trucks, Old Dominion is one of his company’s biggest customers. Already, customers have booked more than 25,000 of the new Cascadia truck models, topping the combined number of orders for the first three years after the 2007 launch of the original Cascadia, which is the leading on-highway truck in North America. Up to 8 percent fuel efficiency improvement over a similarly spec’d previous Cascadia model. A revolutionary new interior and design. Detroit™ Connect Virtual Technician℠, which allows full remote diagnostics and many upgraded features that help customers optimize both uptime and their business results. Detroit Assurance® suite of safety systems, which provides a number of safety technologies including adaptive cruise control in congested traffic. It also gives drivers full braking on stationary and moving objects, as well as warning and partial braking on pedestrians. No other Collision Mitigation System (CMS) for commercial vehicles offers these capabilities. 227 service centers in the United States. "We look forward to continuing our partnership with Freightliner to maintain an advanced fleet crucial to OD helping our customers keep their promises," Newby said. According to Newby, since 2006 Old Dominion has invested more than a billion dollars to significantly expand and improve its service center network and fleet, resulting in a unique ability to offer national, inter-regional and regional shipping solutions through a single network. For more information about Freightliner, visit www.freightliner.com, and Old Dominion Freight Line at www.odfl.com.